In what was known as ‘The Disruption’ of 1843 many ministers throughout Scotland broke away from the established Church of Scotland to form the Free Church of Scotland. New churches quickly appeared and these often were accompanied with their own schools. The Free Church in New Cumnock and its manse were built on the castlehill with the school and schoolhouse alongside. 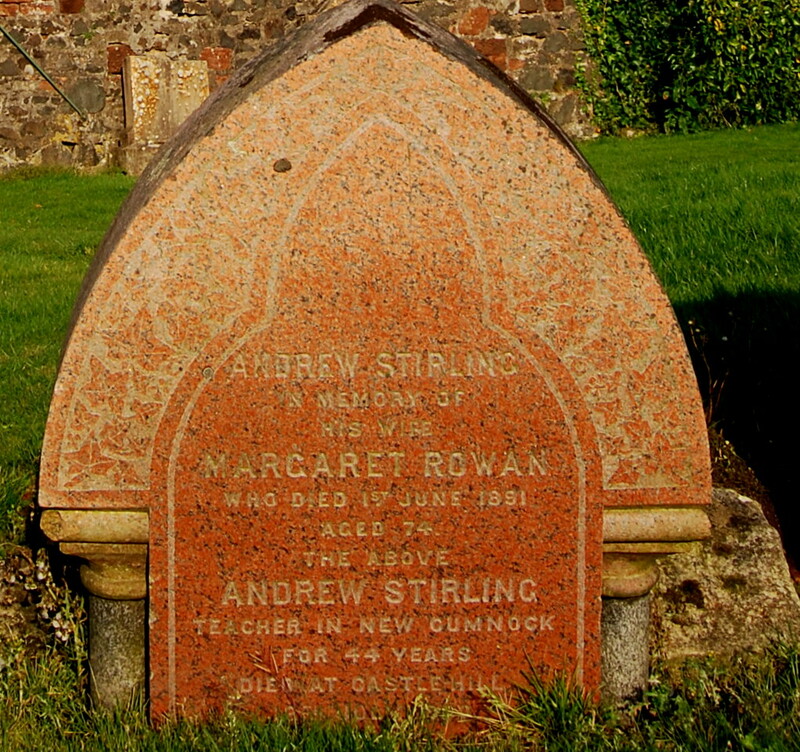 In 1846, 19 year-old Andrew Stirling from Mauchline was appointed the first teacher of the Free School. He married Margaret Rowan from Ochiltree soon after and together they had four sons – Hugh, David, Andrew and John. Known affectionately as ‘The Maister’ many of the classes were held outdoors with memorable trips to Corsencon hill or up Glen Afton or some other places of interest. He would teach his pupils how to fly kites, swim in the Nith, and to sow and grow of flowers. ‘He identified himself with all and by doing so he was loved by all’. Compulsory education was introduced in Scotland in 1872 and the following year two new public schools were built in the parish, New Cumnock Public School (known as ‘The Toon School’) and the other the Bank Public School. Andrew was also in charge of the Free Church Sunday School , pressed for the first public library, represented the ratepayers on the Parochial Board, was a trustee of the ‘Arthur Trust’ and was always in demand as a public speaker. In 1905 the Parish Council discussed a proposal to erect a monument to him; however this was not followed through. Hopefully, this tribute goes some way to honouring his memory. New Cumnock Public School continued to serve the community ever since and in later years it was New Cumnock Junior Secondary School and then in 1970 it was renamed the Castle Primary School. In 2012, after undergoing a £9.6 million refurbishment it is now the fantastic new New Cumnock Primary School, home to the pupils of the former Castle Primary and Cairnhill Primary School.